The Clock poker scanning camera can work on a far scanning distance. 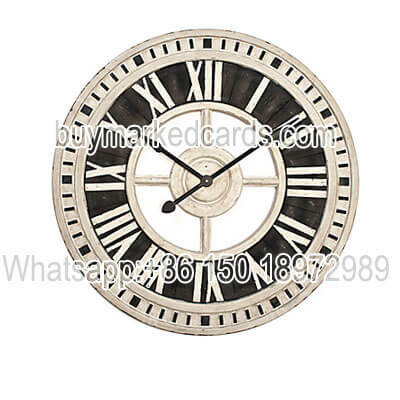 Clock are normal used object in daily life, and there is no one will doubt that a Clock which hang in wall in casinos or private clubs' a poker room. Due to this reason, the long distance scanning camera has been developed. The clock can be made as infrared camera and the scanner to scan the bar code marked cards. Someone would ask if the clock scanner really can do that? This is a good question. Clock long distance poker camera has a powerful function to scan the bar code on marked playing cards at a high speed. This long distance scanner can solve the problem that which camera is far from the table. The distance can reach 3 meters far. With the perfect quality bar code deck, and advanced good poker analyzer, you can get the winner result within 0.1 second. Just provide the details dimension data, a custom-made infrared camera can also be made. any range distanced is available. Write us on Whats app to get favorable price for the poker scanner soon. Compare with the lighter poker scanner which works on the poker table, the Clock poker scanning camera can work on a far scanning distance.